It is incredibly easy for a disaster film to move from the realm of tension, panic, and grief into exploitative, but I think all it really takes is a seasoned director to man the helm and deliver the goods. Additionally, if we can see a film that rightly places the blame where it should be, without turning its villains into caricatures, then that is something worth taking in. Peter Berg is an American director, actor, producer, and screenwriter. His directorial film works include stinker Very Bad Things, followed by the winners The Rundown and Friday Night Lights, then a string of failed movies in The Kingdom, Hancock, and Battleship. Berg finally picked up his stride once again with three movies that star Mark Wahlberg in the war film Lone Survivor (2013), the disaster drama Deepwater Horizon (2016), and the Boston Marathon bombing drama Patriots Day (2016). Berg is known for taking a cameo in his films, with the last six featuring him in one way or another. 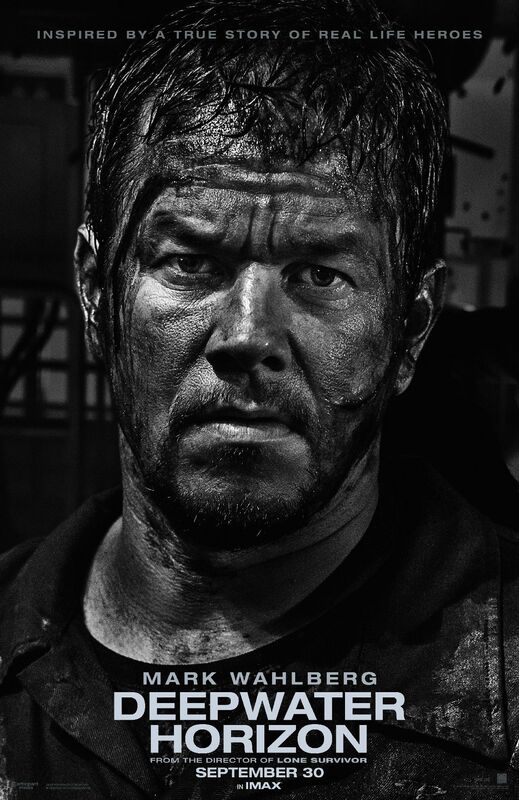 Berg may have found his golden boy in Mark Wahlberg, but how does Deepwater Horizon shape up as a drama with thriller elements? For starters, the film opens with a recorded testimony from survivor Mike Williams (Mark Wahlberg) following the real-life aftermath of events that inspired this film. Mike spends the last few moments of his morning with wife Felicia (Kate Hudson) and daughter Sydney (Stella Allen) before he goes to drill for the next twenty one days. They listen to their daughters on her dad and his job in which he “tames the dinosaurs”. She asks her dad to bring her back a dinosaur tooth for proof. Andrea Fleytas (Gina Rodriguez) is also headed out, but her car stalls. She attempts to fix it, to no avail Her boyfriend takes her in on his motorcycle. Mike and Andrea arrive at the well, Deepwater Horizon. Joining them is Jimmy Harrell (Kurt Russell). We quickly learn that the team which is leaving didn’t complete a test called a cement log. The main crew isn’t happy with decision. As Jimmy unravels the decisions he learns British Petroleum (BP) company men, Donald Vidrine (John Malkovich) and Robert Kaluza (Brad Leland), are responsible. Mike is given a real dino tooth from a coworker. The BP executives are frustrated by project delays, and remove site inspections and order minimal system tests to make up for lost time. Harrell, Williams and team helplessly protest for safety. The drilling goes through and sparks a series of failures which result in a massive blowout, killing some men in the explosion. Harrell is injured while taking a shower, and Williams is knocked backwards after talking to Felicia on Skype. Off the rig, Andrea tries to call a mayday, but she is reprimanded for her actions without authorization. Eventually the coast guard arrives, taking the remaining crew members with them, but another explosion prevents Williams and Andrea from making it with them.They climb to a higher level to jump over the flames and make it to the boats. Andrea panics and Williams is forced to push her off the rig. The survivors are swarmed by reporters outside a hotel, and Williams is assaulted by an upset man looking for his son. Williams breaks down in the shower, and when his family does arrive he hands his daughter the tooth. The film ends with video of Williams, Andrea, and Harrell giving their testimonies. Both Williams and Andrea have since left the industry while Harrell continues to work for Transocean, the drillsite company which works with drillers like BP. The April 2010 spill resulted in over 210 million gallons of spilt oil in the Gulf of Mexico, the worst disaster in history, with eleven dead crew members. Pros: The tension builds as we anticipate the looming disaster, but the tone never reaches a point of disbelief. The characterizations are real and flawed, with plenty of opportunity for compassion towards the survivors of the explosion. Cons: We are left with a lot of questions as to how and why the explosion occurred in the first place. Additionally what explanation we are given as to how the rig functions isn’t easily explained for the audience. Points of Interest: An oil rig was built just for filming and it has been deemed the largest set piece ever built. This is the first time that Kate Hudson and stepfather Kurt Russell have worked on a film together. Berg might have been considered a poor choice to direct Deepwater Horizon, given his track record with his other at sea film, Battleship. However, it’s clear that telling biopics which feature an everyman (in Mark Wahlberg) have allowed Berg to stretch his wings and deliver a tightly paced and realistic film. This is an excellent reminder of the biggest oil disaster the world has ever witnessed and should not be missed. Another week for a biopic dear readers. But this one is an even better tribute to the efforts of those brave souls who endured this tragedy. I don’t think I’ve witnessed a better example of catastrophic greed in recent years, and there is a palpable amount of action there to keep even the casual viewer invested. I have a theory that this film will inspire a new generation of eco-conscious global citizens. And of course, come back tomorrow for some wisdom on princess culture.